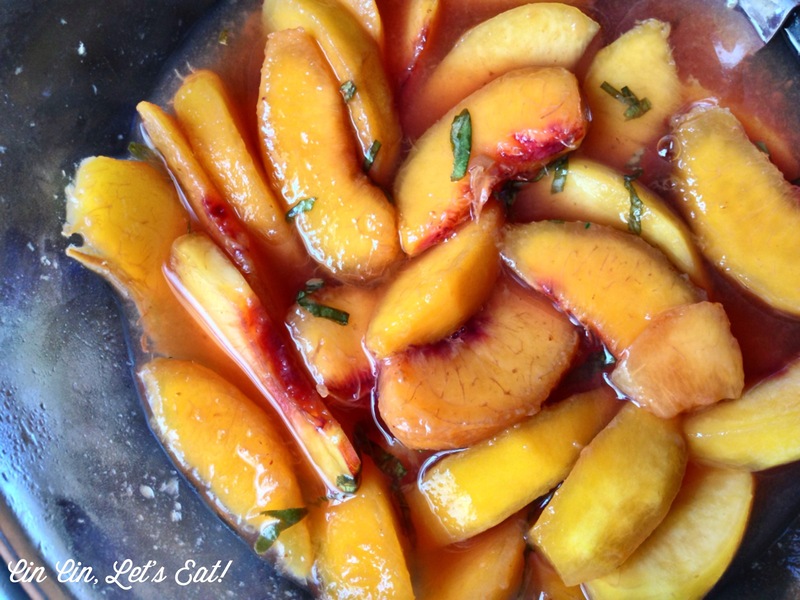 Peaches in Lillet [recipe] – Cin Cin, Let's Eat! 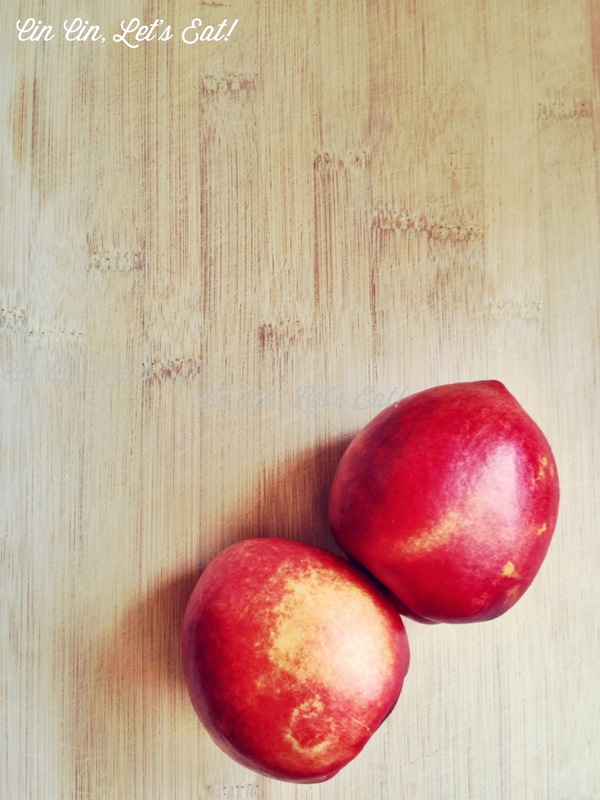 Peaches and nectarines are one of my favorite fruits but over the years I have developed oral allergy towards them along with various other fruits especially the ones with pits, not serious allergies that cause my throat to close up, just itchiness in throat and gum, very uncomfortable. Anyone out there have similar problems like me? I know a few friends and family members with the same problem. And the most irritating part is that depending on the season and my body condition, my reaction to these fruits are different every time, sometimes I can even eat them with no problem what so ever…so this leads to me constantly testing my body and see what fruits I can eat today and get away with. My doctor will probably give me a long lecture if he finds out about this. The good news is that once the fruits are cooked or processed, I’m not longer allergic to them, I’m guessing some type of enzyme breaks down during the heating process. I usually roast the sliced fruits and then puree them in order to turn them into decadent ice cream or healthy fruit smoothies, but most of the time I can’t help it but to make peach pies, tarts, and galettes. But yes, I’m on a never ending mission to find recipes that allow me to still taste the fruits in their fresh form with minimal cooking. Needless to say I’m bummed that the peach and nectarine season is almost over, but luckily we can still find some juicy and perfectly ripened ones at the farmers market on weekends. I came across this simple recipe from Eric Ripert, and couldn’t resist to try it! There I was, playing doctor, and thought maybe by soaking the fruit in alcohol, it might have the same effect to get rid of the allergens. Well, it turns out that alcohol kills bacteria and germs but not allergens. I’m such a quack! This is a great substitute to any rich and heavy dessert, sweet and very refreshing. And it is so easy, literally combining 3 ingredients together and wait. The longer you wait, the more flavorful the peaches will be. It will be the perfect finish for your labor day weekend bbq (adults only, of course! *wink. ) And I’d like to think it’s healthy too, it’s mostly fruit right? haha. 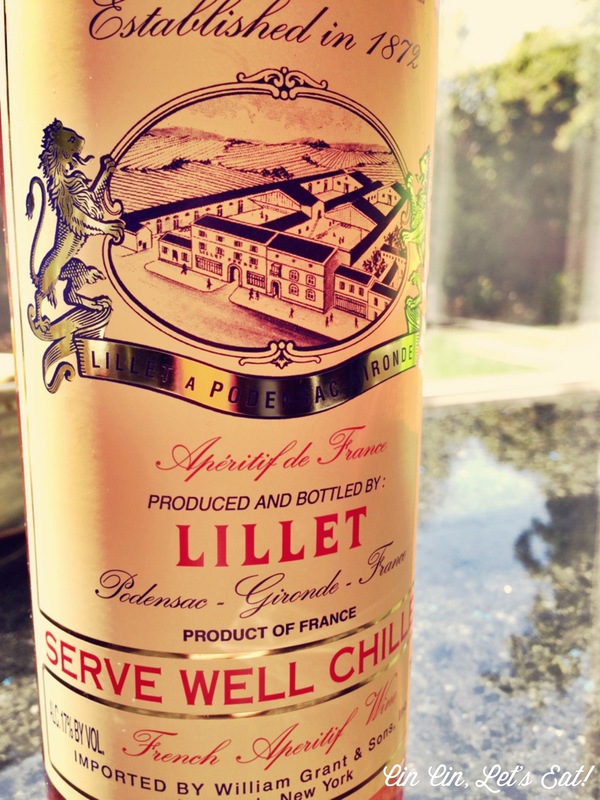 Lillet is a fortified French wine, and you can find three different types (red, white, and rose) in the store. I used rose this time, but the white Lillet will also work wonderfully. I used both yellow nectarines and peaches. The recipe states to use a whole bottle of Lillet, but I only used enough to cover the peaches, about half a bottle. 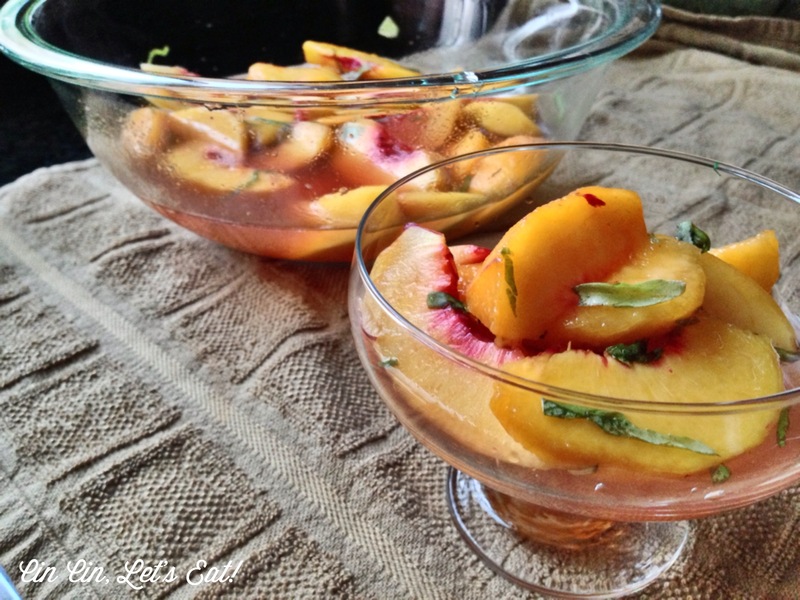 Toss peaches, Lillet, and basil in a large bowl. Cover and chill at least 2 hours. 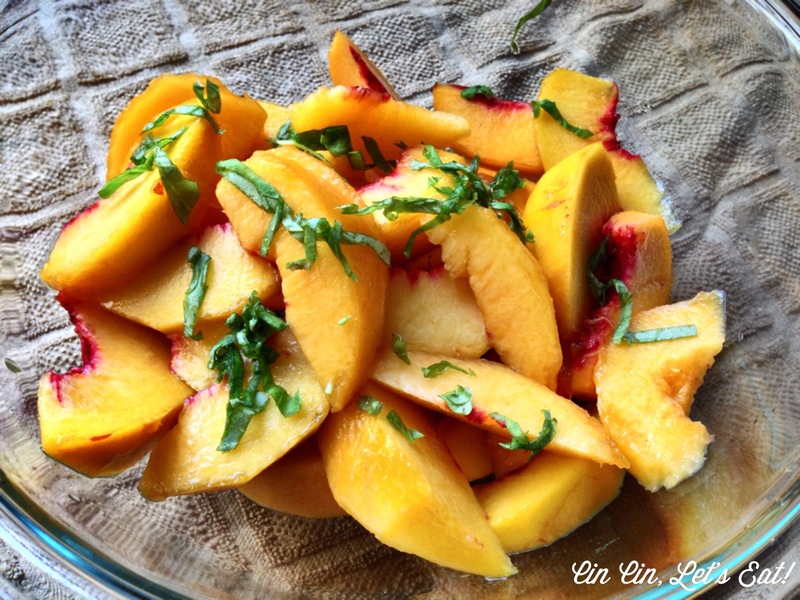 DO AHEAD: Peaches can be marinated 1 day ahead. Cover and chill. Here they are, after only two hours, the nectarines still maintained a bit of the crisp. And here they are, overnight. Look at how different the peaches and nectarines look. Each slice is nice and soft, completely soaked with Lillet, and the basil adds a nice herby flavor to the sweetness. And of course I couldn’t help myself and ate a small bowl of this. Pure bliss for a few minutes and then suffered a bit afterwards. I poured the rest into small mason jars and brought them over to my parents for them to enjoy. Have a wonderful long weekend, my fellow foodies! I’m off to Napa for a much needed R&R! Great post!! I love peaches and nectarines, too. Enjoy Napa! 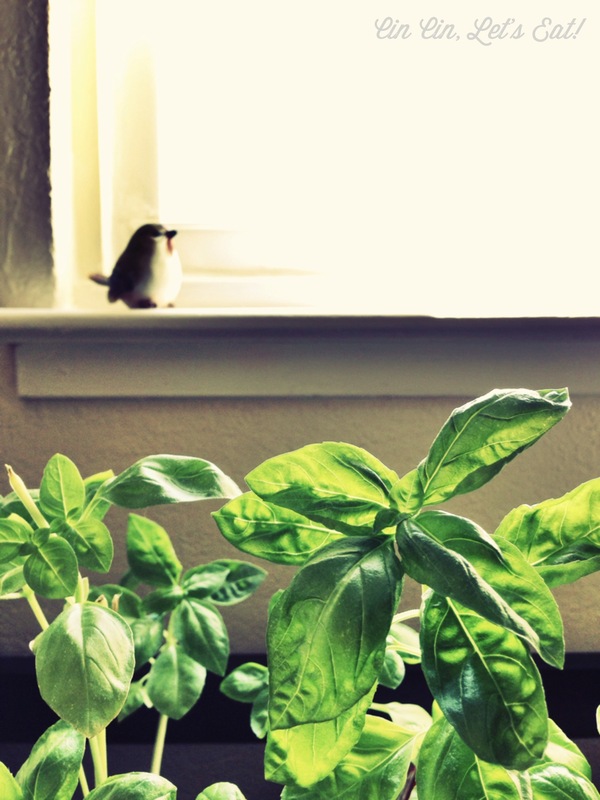 Pingback: How to Grow Sprouts With Mason Jars | Cin Cin, Let's Eat!